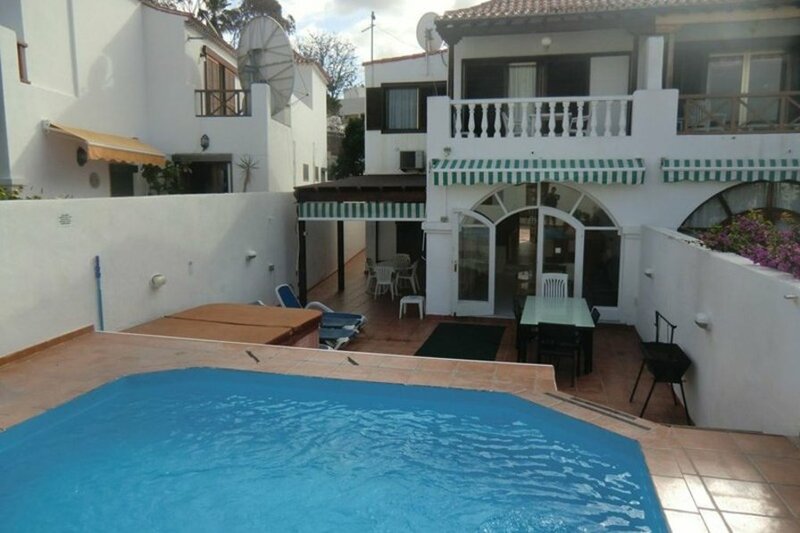 This is a hugely popular 5 / 6 bed, 5 bath Tenerife villa in a fantastic location. Set in quieter cul-de-sal this Tenerife villa is set just 200 metres from the beach at Playa de las Americas. The villa which resembles a traditional townhouse is on 3 levels and has air conditioning in most rooms. This unique Tenerife villa to rent has it's own private heated pool, jacuzzi and games room! It is also part of a bigger complex of Paraiso Royal. You can therefore enjoy use of the communal heated pool and pool bar too! The ground floor has a large fully fitted kitchen with dishwasher, oven/hob, fridge, microwave, table and chairs for 4. The ground floor consists of a large split level lounge/diner with a table and chairs, sofas, amrchairs satellite TV with some English speaking channels. The 1st floor consists of 3 double bedrooms all with ensuite. On the basement level there are two bedrooms, both with twin beds, and a shower room each. On this level is also a games room with pool table and dart board (games are free of charge). This is a unique Tenerife villa - a private and a communal pool! 3 double bedrooms on 1st floor with ensuite. 2 twin rooms in basement with a shower room each . Private heated pool, jacuzzi, patio furniture and sun beds.